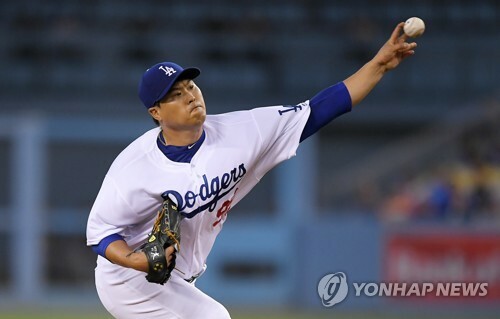 SEOUL, Sept. 6 (Yonhap) — Ryu Hyun-jin of the Los Angeles Dodgers has picked up a no-decision against the Arizona Diamondbacks, the same club that knocked him around just a week ago. Ryu held the Diamondbacks to just one earned run on three hits in six innings at Dodger Stadium in Los Angeles on Tuesday (local time). He left the game with the score tied at 1-1 and remained at 5-7 for the season. Ryu lowered his ERA from 3.71 to 3.59. In his previous start last Wednesday, the D-Backs torched Ryu for three home runs in just four innings, as the South Korean left-hander allowed a season-high six earned runs. This time, Ryu came back with a vengeance, holding Arizona without a hit through three innings. The Diamondbacks got their only run off Ryu in the fourth inning, when Daniel Descalso hit a double off the left field fence with one out. The ball came within inches of leaving the park for a three-run home run. Ryu prevented further damage in the fourth with a strikeout and a groundout. He had a comebacker go off his right leg in the fifth but shook it off to stay in the game. Yasmani Grandal hit a game-tying solo home run for the Dodgers in the bottom fifth, but they failed to stake Ryu to a lead. The Dodgers went on to drop the game 3-1 in 10 innings for their fifth straight loss. Thank you for sharing informative post here.